Showing results for tags 'saaf'. I know everyone here has been waiting for a Border War terrain and have been salivating over the few screen shots released over the years... The wait is over! This terrain is a Massive terrain covering most of South West Afrika with the Caprivi Strip, as well as Almost all of Angola as well as much of Botswana, some of Zambia and a small portion of the Congo. It is meant to cover the entirety of the Border War Conflict between FAPLA, SWAPO and the SADF, UNITA and SWADF. The Terrain covers many types of environments from the Skeleton Coast to the wetlands to the great plains and Bush of Ovomboland. 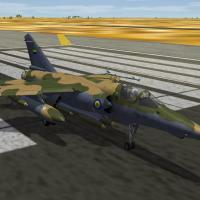 This is meant to be a truly African terrain to fly the assortment of South African Air Force birds available here at CA. This terrain was truly a team effort that started a few years ago and has passed through many hands along the way. The terrain was originally started by Centurion 1 and Coupi back in the 2013ish time frame and has been held and slowly worked on by a dedicated team here at CA comprised of but not limited to... Stratos, Ludo.m54, Jeanba, Pualopanz, Coupi, recently me Spudknocker and even more recently tiospilotos... I have brought together all of the pieces left behind by Centurion 1 and others and brought the terrain up to a playable and very fun level to share here at CA. This really is a BETA release to show everyone what we have been working on! If you have any suggestions or want to help out with this project feel free to PM me, Coupi or Jeanba! I could not have done so without Mue's AMAZING target area editor, Gerwin's FANTASTIC TFD tool and last but not least Wrench's incredible wealth of strike fighters knowledge. Also included here with the terrain are several SAM's modified slightly from the original SF2 SAMs package for use by Angola as well as a stand in Impala MkII and SAAF Alouette III helicopter. 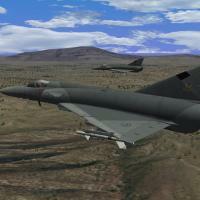 More SAAF and FAPLA related skins and aircraft will be released shortly! Thanks for everyone's support here at CA and everyone's patience in waiting for this terrain. Mirage F-1AZ. This mod is dedicated to BPAO, nothing would have been possible without him. Single-seat strike and multi-role fighter. It is a simplified attack version with extra fuel in place of radar and some other all-weather avionics. The South African Air Force recognized the advantages of a simplified version of the Mirafe F1CZ for day visual attack missions. The resulting Dassault-Breguet Mirage F1AZ is visually distinguished by having a slender conical nose, resulting from removal of the large Cyrano IVM radar. In its place is the ESD Aïda II ranging radar and a laser-ranger, with a large instrument boom housing the pitot/static heads attached on the underside of the nose. The main avionics racking is moved from behind the cockpit to the nose, making room for an extra fuselage tank. Other additions are a Doppler radar and a retractable refueling probe. South Africa received 32 aircraft for service with No. 1 Sqn. The aircraft were withdrawn from service in 1997. Ironically, it was the F1AZ's usefulness that indirectly resulted in its retirement. In ther late 1980's, the initial plan was for the F1AZ to be upgraded after the Cheetah program was finished because the SAAF couldn't take the risk taking it's fleet of F1AZ's out of the front line without a similarly cabable aircraft to take their place, which couldn't exist untill the Cheetah C. However, once the Cheetah upgrade was completed (mid-1990's), the budget had been slashed and there was no longer sufficient funding. Faced with mounting operational costs, a tiny budget adn what amounted to a new type in service, the SAAF did the logical thing and retired the F1AZ's to focus the remaining funding on the Cheetah C and D. Covered unit : N°1 Squadron Early Camo. N°1 Squadron Experimental Camo. N°1 Squadron Low Visibility camo. N°1 Squadron Low Visibility camo and post 1994 marking. Gabonese Air Force. 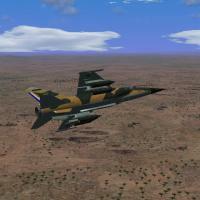 Congolese Air Force Installation : - Copy and paste the Objects folder in your mod folder. 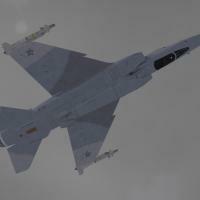 Changelog : - 30MM_DEFA553 gun folder added. Crédits : - Aircraft : BPAO and Centurion-1. - Cockpit : Brain32 and Centurion-1 - Skins and decals : Ludo.m54. - Templates : Brain32, ACE888 and Ludo.m54. - Avionics and data tweaks : Crusader. - FM : Baffmeister. - Interception light : Coupi - Weapons : Ravenclaw_007. - Hangars et loading screens : Ludo.m54. The ejection seat should be a Martin Baker Mk4 but we don't have this model.So If there is a modder who wants to make it, he will be more than welcome. 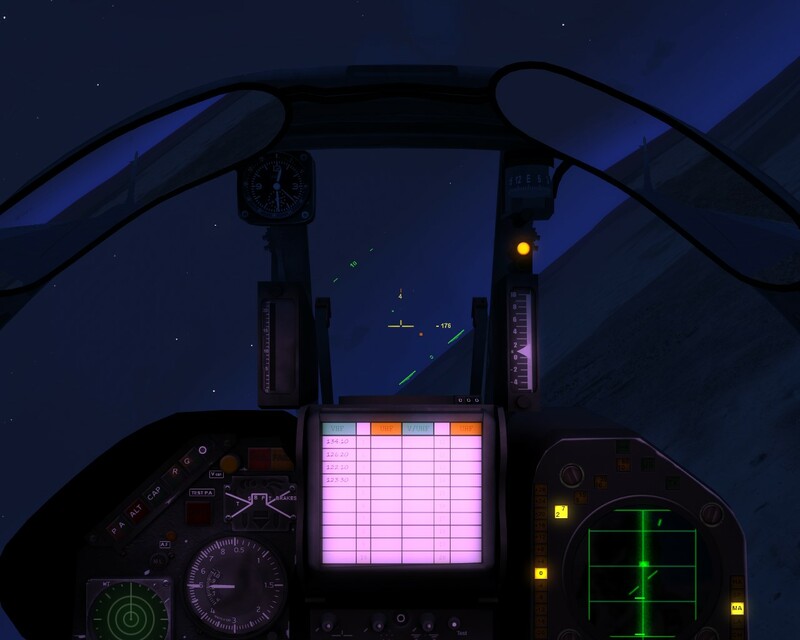 A big thank to all on Combatace and C6 forums that helped us solving issues we encountered. Any omission in credits is totally unwanted, if I forgot somebody, let me know, I will correct this. This addon is and will in all cases remain freeware. Released under CombatAce Fair-Use terms. Enjoy The Mirage F-1 Team. Mirage F-1CZ. This mod is dedicated to BPAO, nothing would have been possible without him. South Africa began looking for a replacement for the Mirage III in 1971 and purchased a licence to manufacture the Mirage F1 and its engine, the intention being to produce up to 100 Mirage F1s. This license was however cancelled because of the 1977 arms embargo. 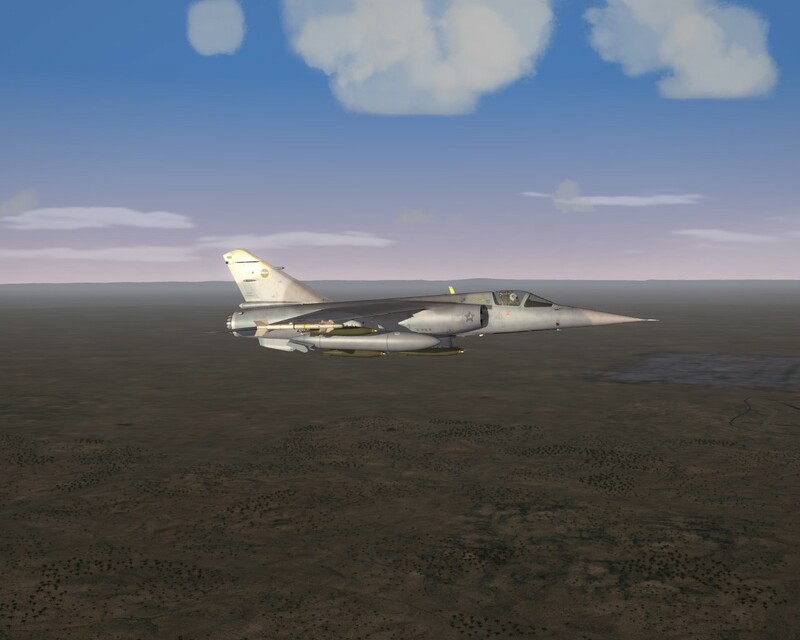 The SAAF then bought 16 Mirage F1CZs and 32 Mirage F1AZs which were quickly delivered by Dassault before the embargo was implemented, with deliveries starting in 1975. Both the F1CZ and F1AZ variants of the SAAF saw action during operations in the Border War. This version include new RWR and chaffs and flares dispensers. Covered unit : N°3 Squadron Annual Air Combat Manoeuvring 1986 Installation : - Copy and paste the Objects folder in your mod folder. 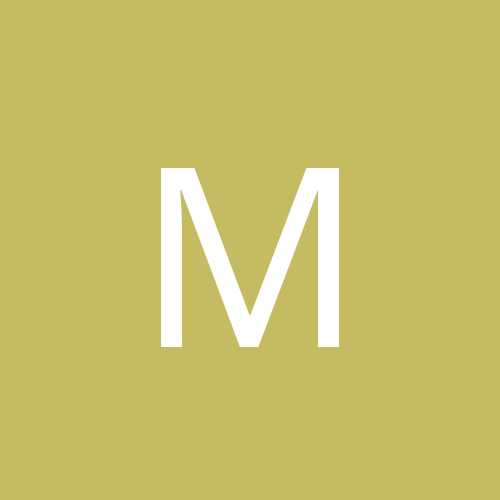 Changelog : - 30MM_DEFA553 gun folder added. ? Crédits : - Aircraft : BPAO and Centurion-1. - Cockpit : Brain32 and Centurion-1 - Skins and decals : Ludo.m54. - Templates : Brain32, ACE888 and Ludo.m54. - Avionics and data tweaks : Crusader. - FM : Baffmeister. - Interception light : Coupi - Weapons : Ravenclaw_007. - Hangars et loading screens : Ludo.m54. The ejection seat should be a Martin Baker Mk4 but we don't have this model.So If there is a modder who wants to make it, he will be more than welcome. A big thank to all on Combatace and C6 forums that helped us solving issues we encountered. Any omission in credits is totally unwanted, if I forgot somebody, let me know, I will correct this. This addon is and will in all cases remain freeware. Released under CombatAce Fair-Use terms. Enjoy The Mirage F-1 Team. Mirage F-1CZ. This mod is dedicated to BPAO, nothing would have been possible without him. South Africa began looking for a replacement for the Mirage III in 1971 and purchased a licence to manufacture the Mirage F1 and its engine, the intention being to produce up to 100 Mirage F1s. This license was however cancelled because of the 1977 arms embargo. 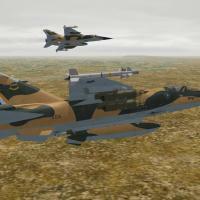 The SAAF then bought 16 Mirage F1CZs and 32 Mirage F1AZs which were quickly delivered by Dassault before the embargo was implemented, with deliveries starting in 1975. Both the F1CZ and F1AZ variants of the SAAF saw action during operations in the Border War. Covered unit : N°3 Squadron Installation : - Copy and paste the Objects folder in your mod folder. Changelog : - 30MM_DEFA553 gun folder added. ? Crédits : - Aircraft : BPAO and Centurion-1. - Cockpit : Brain32 and Centurion-1 - Skins and decals : Paulopanz and Ludo.m54. - Templates : Brain32, ACE888 and Ludo.m54. - Avionics and data tweaks : Crusader. - FM : Baffmeister. - Interception light : Coupi - Weapons : Ravenclaw_007. - Hangars et loading screens : Ludo.m54. The ejection seat should be a Martin Baker Mk4 but we don't have this model.So If there is a modder who wants to make it, he will be more than welcome. 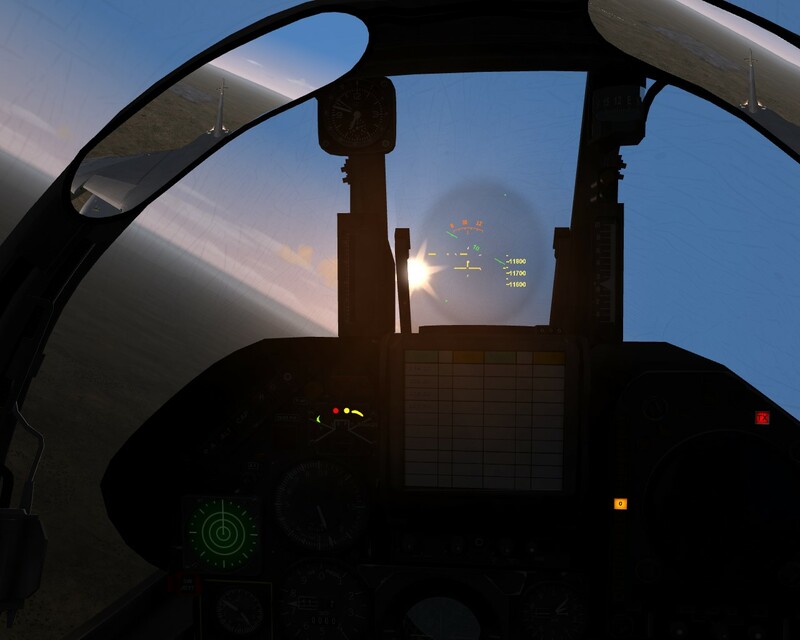 A big thank to all on Combatace and C6 forums that helped us solving issues we encountered. Any omission in credits is totally unwanted, if I forgot somebody, let me know, I will correct this. This addon is and will in all cases remain freeware. Released under CombatAce Fair-Use terms. Enjoy The Mirage F-1 Team. Hello guys, as you might have seen, Stratos, Coupi and me are working on a new Angolan terrain that depicts most of Angola and a good portion of then South-West Africa now Namibia too. The reason for this is that a good terrain for flying the SAAF birds has been long overdue. The terrain is 1000km x 1000km. Coupi had started an even larger terrain that depicted most of SW Africa but in order to try to keep this managable we decided to go a little bit smaller and use a default TW terrain size. This terrain is being created from scratch and we hope to have a reasonably good representation of the area when we are done. Ofcourse, the area is extremely diverse when it comes to natural features, but we will do our best with what we got. A special thanks goes to Gerwins new TFD tool that has enabled rapid and accurate targetization of the terrain. Stratos has added over 200 cities, airfields and target areas already. In the mean time I have been busy trying to recreate the diverse nature in the tileset, it's early days still but things are looking if not perfect then at least satisfactory! The tiles are all built from satmaps from this actual area. There will probably be closer to or over 10 different terrain types when we are done. Marshy wetlands found in particular in NE Namibia. The tiles are build using satelite images from this area. Savannah with some african trees visible. Will be even more diverse when done. Semi-arid bushterrain (sans bushes) and rocky cliffs. But we need your help guys, we are too small a team to make everything needed. Stratos did a good review of what we got for a bush war campaign and what we still are lack : Especially the ground units and Impala Mk1 / 2 would be quite high priority if you ask me. In addition to this, we of course need good Angolan skins for the red birds they flew. The MiG-17 and 21 in particular, while the new MiG-23 is being worked on. So that is what's cooking, so to speak. We are very eager to finish this, but there is a lot to do so any help would be welcome, whether research, ground units or objects, tileset help or whatever else you can do.